We give thanks on Thanksgiving Thursday, and then we have Black Friday, Small Business Saturday, and Cyber Monday to get our shop on. – it’s time to add a new day to the week. Welcome to #GivingTuesday™ – a campaign to create a national day of giving at the start of the annual holiday season. It celebrates and encourages charitable activities that support nonprofit organizations.Families and individuals are encouraged to be generous in whatever ways matter to them, whether that means volunteering at a local charity or donating to a favorite cause. Since Thanksgiving falls with Hanukkah this year, Cole and Lulu will be receiving a few new art supplies as their gift, and we will spend some time on Thanksgiving making holiday cards, which we are going to distribute at the nursing home on Tuesday, December 3. Local friends, if you’d like to join us, you are more than welcome – or if you want to make some cards, we’ll give them out for you! @GivingTuesday invites you to join a movement to celebrate giving and encourage more, better and smarter giving during the Holiday Season. How will you give back? www.givingtuesday.org . Are you busy pinning away holiday gift ideas and crafty fun? 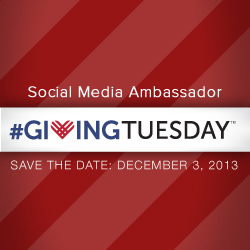 You can help #GivingTuesday on Pinterest, too! Create a board of “ways to give back” that highlights ideas within your community. Create a multi-media board with video, audio, images and articles that highlight how you have given back over the years. YES, YES, YES!!! This is AWESOME!!! Giving Tuesday is a fantastic concept and we will most DEFINITELY be participating!! I’ll be tweeting about this RIGHT NOW! !